The figures in these calculations use the Nissan Qashqai, the most popular SUV on Britain’s roads, with a kerb weight of 1419kg and a Coefficient of drag (Cd) (how well it slips through the air) of 0.32 and a rather hefty frontal area (A) of 2.6m2. All the energy figures are given in Watt-hours (Wh) and kilowatt-hours (kWh). Some useful comparisons are available here. All working out is shown at the foot of the page. Probably the most common argument in favour of 20mph is a safety one and it’s a very sound assumption. A driver seeing a danger travelling at 30mph would have travelled 9 metres before they even pressed the brake pedal and another 14m to come to a stop. At 20 mph the overall the stopping distance is half that at 30. This makes a collision less likely in the first place. The kinetic energy of our car travelling at 20 mph (8.94m/s) is 15.7 Wh. If the vehicle didn’t stop in time, this would be the energy felt by the object it hits. Increase this speed by 50% to 30 mph and the kinetic energy goes up by 125% i.e. it more than doubles to 35.4 Wh. 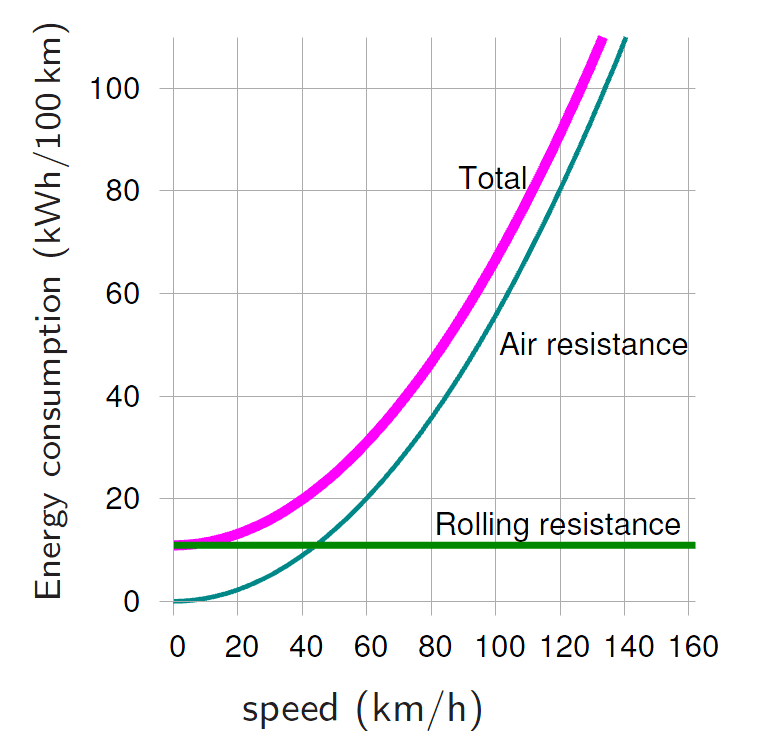 To put this in comparison, the energy of a 90kg cyclist at 20 mph is 0.9 Wh and a 70kg jogger at 5mph, 0.05 Wh. These figures have formed a key part of Sweden’s Vision Zero Strategy, which puts the energy of vehicles and their impact on humans as one of the key focal points. It is research from this that influenced the THINK! campaign in the 90’s. The principles behind this message are summarised in the graph below. 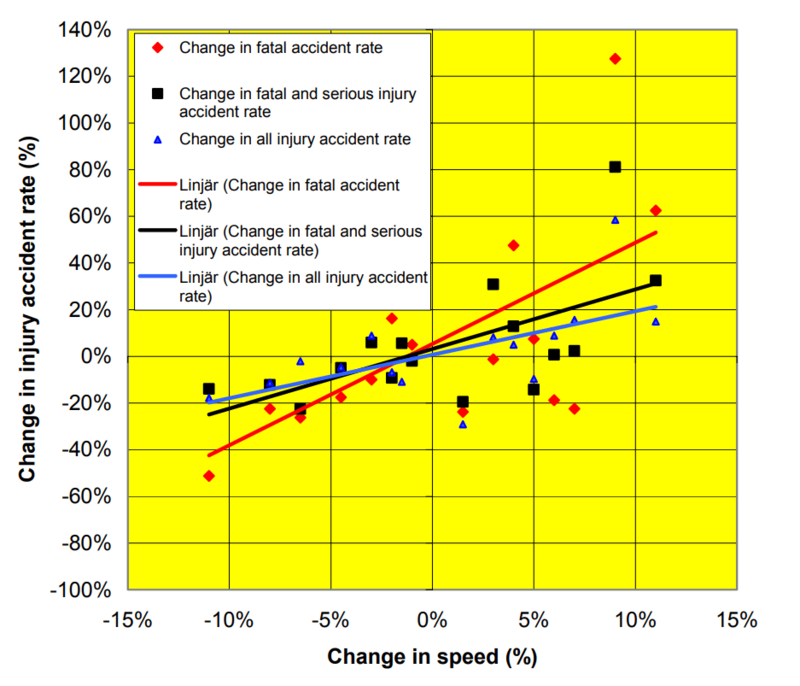 As vehicle speed increases the consequences of injuries sustained in a collision dramatically increases. In Bristol, thanks to 20mph limits, there has been a reduction in the number of fatal, serious and slight injuries from road traffic collisions. Casualties avoided per year are 4.53 fatalities, 11.3 serious injuries and 159.3 slight injuries. 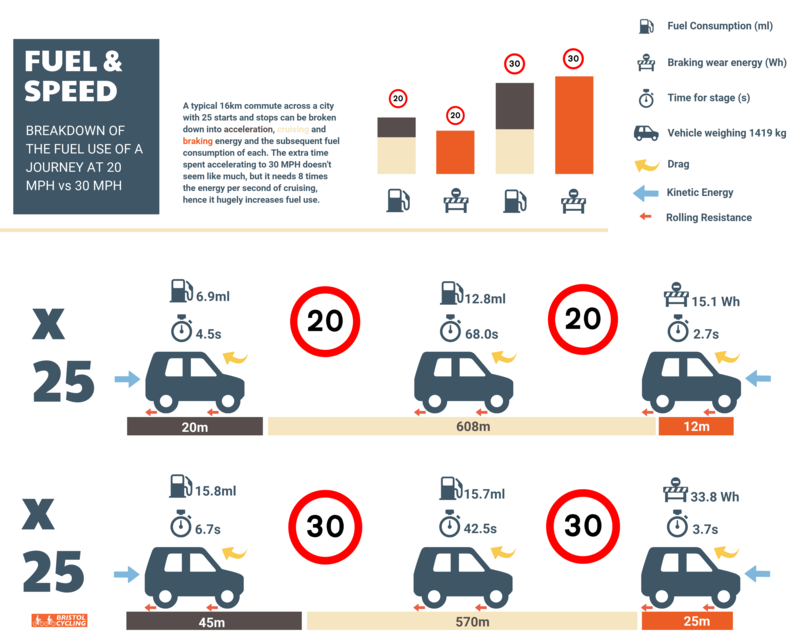 One of the main arguments against 20mph is that people think they are getting delayed and their journeys are taking longer. This might be the case if we were driving on long straight empty roads (like in the car adverts), but Bristol is hardly that. The animation below shows the principles of the concertina effect (created to show the benefits of vehicles with sensors to control their distance to other vehicles). The greater the speed difference between drivers on a stretch of road, the more likely it is that this traffic behaviour will happen, as is demonstrated in the lower animation. Once this happens, traffic backs up, even though the road ahead might be clear. The concept is explained in this article and the principles are demonstrated in a study on Helsinki 20 and 25mph speed limit zones which found traffic flow improvements. At peak times within the 1-mile radius of central Bristol, average driving speeds are just 8mph. Even 5 miles out of the city this only increases to 12mph. Driving at 30mph not only means a journey takes longer, but more of it is spent accelerating, braking or stopped in a queue. Once upon a time, it was assumed (in the UK anyway) that lower speeds result in higher fuel consumption, due to the typical speed/fuel consumption profile of an internal combustion engine (ICE) car in a straight line on an empty road. This myth has largely been disproved. To accelerate the vehicle up to speed we need to give it kinetic energy (KE). KE is also squared with speed. So to reach double the speed requires 4 times the energy. If our vehicle was travelling in space (which is a vacuum) it would keep going until it hit something, however because of air and rolling resistance it needs constant energy input to overcome these. For a car driving 16km (10 miles) across town with 25 stops and starts, we can break the journey into equal 640-metre portions for simplicity. If the vehicle accelerates up to 30mph instead of 20mph it needs an additional 21.7 Wh per acceleration. Because ICE cars are at best 25% efficient (for urban driving 15% might be a more reasonable estimate) this is multiplied by 4 to give 86.8 Wh. A litre of petrol contains 9.7 kWh of energy, which equates to an additional 8.9ml of petrol per stop and start. At £1.27 per litre of fuel that’s an extra 1.13 pence per acceleration. Factoring these figures up to the full journey is a full 28p saved on accelerations alone. In both directions, the total fuel savings of only travelling at 20 are equivalent to around a pint of fuel. Further extrapolating this calculation to all 261 working days in 2018, savings from travelling at 20 instead of 30 are a staggering £196 or an equivalent energy consumption of 1495 kWh. Which is similar to the electricity consumption of a single person household for a year. For hybrid cars, lower speed limits allow the car to run on the battery more often, further reducing fuel consumption. Lower fuel consumption is not directly proportional to reduced exhaust emissions due to the complexities of ICEs, however, an in-depth study in London found 20 mph did reduce vehicle emissions, again mainly because the lower speed is more conducive to less erratic, smoother driving which reduces exhaust emissions. It also highlights that changes in average speed and accelerating and decelerating behaviours will be beneficial to non-tailpipe emissions of particulate matter, discussed in greater detail in the next section. But what about climate change? Every government in the previous 20 years has told us climate change is the greatest threat we face and then puts it to the bottom of the list or takes it off altogether. In the previous two elections, it has barely been mentioned. It’s seen as a nice to do, maybe if one day the world is rich enough. Yet the costs of inaction are already staggering and will only grow. The chances of us meeting the non-binding Paris agreement limiting temperature rises to 2 degrees is small and it is now predicted that 3 degrees will be the likely minimum temperature rise. To put it in perspective, a 5-degree average temperature drop would put us in a full-scale ice age. Action has never been more urgent. Bristol City Council lists an increase in CO2 emissions as a risk of a “Clean Air Zone” (CAZ), as people might (and are encouraged to) simply swap diesel cars for petrol. 20 mph limits reduce CO2 emissions. The national institute for clinical excellence (NICE) recommends physical measures to encourage 20 mph adherence. The Autonumber Plate Recognition (ANPR) cameras proposed for the CAZ could be used for this. Potholes are a pain for cyclists and motorists. We hear a lot about the terrible crashes they cause and the damage they do to vehicles, but what about the cause of them? The fourth power law is well-established theory for calculating the effect vehicle weight has on road damage. A 50% increase in axle load results in a five-fold increase in calculated structural wear. Our car with an average UK person (76.9kg) does 53,643 times the damage of the same person on a (very heavy) 20kg bicycle, rolling over the surface of the road. Even a 2,250kg Tesla Model S compared to a 1384kg average car, does nearly 6.5 times the damage to the road. As just mentioned, the energy in our car at 30 MPH is more than double that of the same car at 20 MPH. 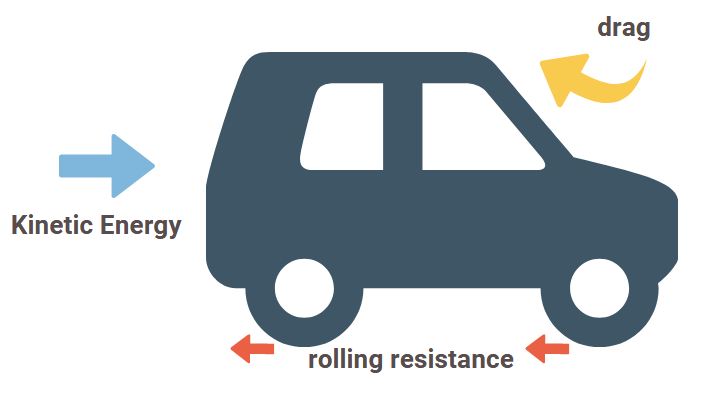 This means the energy, which dissipates through the brakes, tyres and roads is greater, causing more wear. Over the course of a year of this article’s 16km commute, stopping and starting to and from 30mph is an extra 436 kWh, over 3 times the energy of the same journey at 20mph. 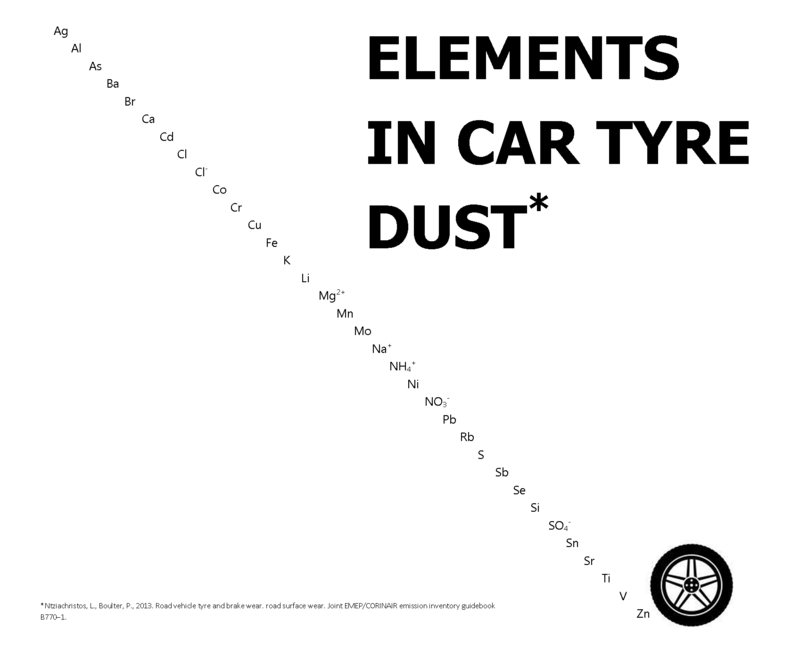 Figure 6 – The composition of tyre and brake wear in terms of various metals, ions, and elemental and organic carbon. Graphic from wattsthecost.info with data from EEA emissions factors. Road, tyre, brake and engine wear all form “non-exhaust emissions”. These are breathed in by people, get mixed up in roadside vegetation and sweepings, such as leaves resulting in them being landfilled instead of composted or burnt for energy. Plastic from tyres even contributes to the growing burden in our rivers and oceans. Less wear associated with 20 mph means not having to change brake pads, clutches and tyres as often. It also means safer streets with fewer potholes and less money needed by cash-strapped local authorities to repair them. It is estimated that to fix all roads in the Bristol area would cost taxpayers £1.2 billion. That would be an additional £10,000 for each of the 100,000 council tax payers in Bristol. It’s estimated that the annual social cost of urban road noise in England is £7 to 10 billion. This places it at a similar magnitude to road traffic collisions (£9 billion). The WHO estimate noise to be the second biggest cause of environmentally related health problems. Road noise is one of the biggest contributors to urban noise pollution. 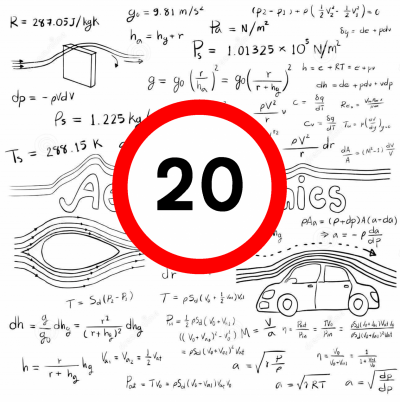 How can 20 mph reduce noise? Put simply noise is wasted energy, so less energy involved moving along our roads means less noise generated. 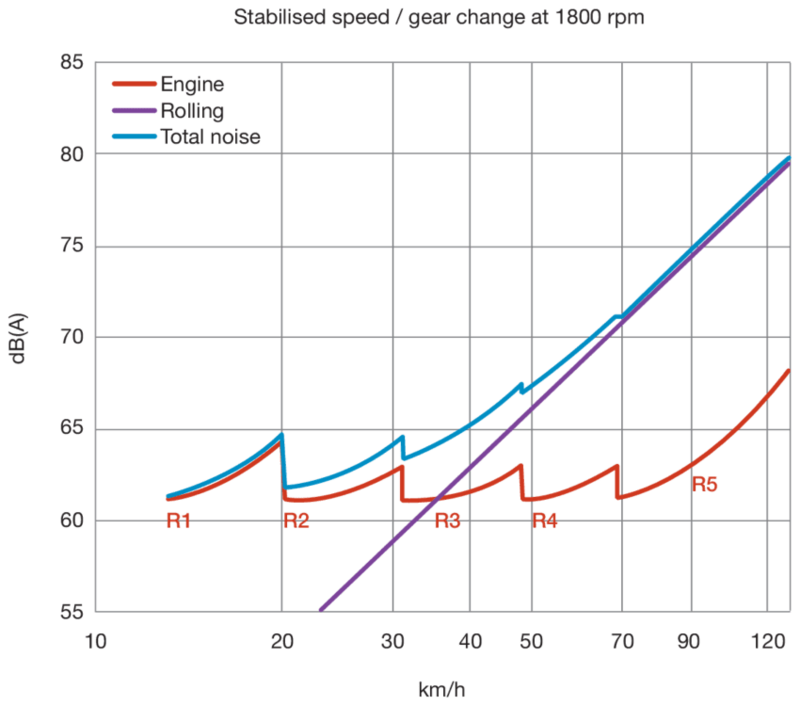 The graph below shows a 10db increase between 30km/h (20mph) and 50 km/h (30mph). In terms of human ear perception, 10db is equivalent to a doubling of the noise level. If you turned a sound system up by 10db we would perceive it as the volume doubling. A German study found the introduction of 30 kmh (20 (mph) zones into residential streets allows a reduction up to 3 dB(A). Another concluded a similar reduction. A 1999 Swedish study found that having an urban environment with combined 50kph (30mph) and 30kph (20mph) zones produces a more “jerky” traffic flow than blanket 30kph (20mph) and consequently more noise (2-4 db increase). Enforced 20 mph limits would have a dramatic effect on the constant hum people living near busy roads hear throughout the day and night. 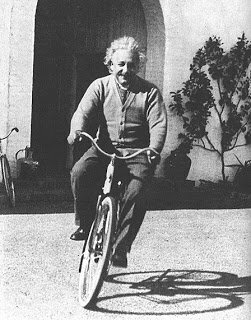 Einstein was an avid cyclist. Not a for weekend sports, but as a means of transport to get around his hometown. He is famously quoted as saying the theory of relativity was conceived whilst riding his bike. We don’t know for definite, but like most other cyclists we are sure he would rather have shared the road with cars moving with half the energy, pumping out fewer fumes and doing less damage to the road. The greatest energy benefit 20 mph can have is if people feel safer cycling on our streets they may decide to leave their hopelessly inefficient automobile at home! The Bristol 20 mph consultation ends on the 31st August 2018. Make sure you register your views https://bristol.citizenspace.com/city-development/20mph-limits-review/ and don’t forget to mention the importance of energy. An infographic summarising this article is available here. A huge credit to the late Sir David MacKay for his book “sustainability without the hot air”, which helped with the calculations carried out here. This outstanding piece of work is available as a free download: http://www.inference.eng.cam.ac.uk/sustainable/book/tex/sewtha.pdf visit pages 254 to 260 for more detail on the basis for these calculations.